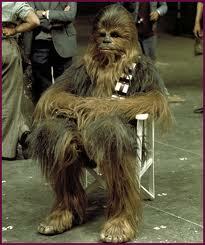 Chewbacca retired from acting in 1993 after his character’s scenes were axed from Schindler’s List. I was a golf pro at a Palm Springs course, but then I had to leave because of … ahem … indiscretions. Then I opened my own series of Korean themed fast food restaurants called Chewie’s Chews; you heard of them? No? I’m not surprised. They were open a week before we got closed down. ‘I wish them all the luck in the world, but at the moment I have my Zumba club to concentrate on,’ Chewie said, before giving us his trade mark arrghghhghhwargghgh.